Shop Printing For Less online at PrintingForLess.com as a one-stop online resource for all your full color printing needs offering a wide range of printing solutions. Printing For Less offers world class commercial printing solutions for businesses and individuals. Printing For Less has various lines of printing solutions including brochures, cards, newsletters, stationery, catalogs, booklets, folders, statement stuffers, CD covers, large posters, mailing services and campaign printing services. 58Coupons.com is your resource for Printing For Less coupons, Printing For Less discounts, Printing For Less deals and Printing For Less savings when shopping at PrintingForLess.com. Get $100 off your first order of Presentation Folders from PrintingForLess.com when you enter this code. Head on over to Printing For Less to save 20% on first time orders of select catalogs with this coupon code. 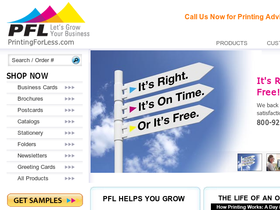 Enjoy this coupon code from PrintingForLess.com to get 20% off your brochure order. As a first-time customer you can save 20% off your newsletter order from PrintingForLess.com when you enter this coupon code. Head on over to Printing For Less and order either letterhead or envelopes and receive 500 business cards for free. Click link for details.